So, like I said, this ought to be good. Angelique is the soap opera witch-vixen supreme, the woman Erica Kane hopes to be when she grows up. She sashayed onto the show three years ago and shantayed the entire Collins family, as well as the audience. Other villains come, sometimes even pretending to be Angelique’s boss for a few minutes, but when they go, begging her to catch them as they fall, she sidesteps out of the way, and prepares for another costume change. She’s done this before, acting scared of somebody in order to prop them up and make them into the new Big Bad — Nicholas Blair and the Leviathans and Tim Stokes and even Dameon Edwards, for about five minutes — but this time they’ve gone all the way back into history to the witch trials of 1692, and inserted a new prologue into Angelique’s backstory. This happens sometimes on soap operas; it’s usually best to stand back, and wait for it to blow over. Laszlo exclaims, “So you became what you are because of Judah Zachery!” The answer to this question is obviously no. “Yes,” she agrees. “But his powers are awesome.” They’d better be. Because I’m not sure I believe in this Angelique, fretting and cowering behind decorative urns. My preferred Angelique is the one who grew up as a poor servant girl in Martinique, and who became a sorceress because she was batshit crazy, and somebody pissed her off. That version of Angelique is commonly referred to as Angelique. Meanwhile, this Angelique of 1840 thinks that she used to be called Miranda DuVal, and she lived in Bedford in 1692, until she confessed her sins to Amadeus Collins of all people, and testified against Judah, and then she ran and hid somewhere and changed her name, until she decided the heat was off and it was time for her to fall in love with Barnabas and take over Dark Shadows. There is nothing that anyone can say to convince her otherwise. “I’m certain that his spirit has lived all this time!” she erupts. “And now it has taken possession of some living person, and he’s in complete control of that person.” She thinks it’s Gerard, because he’s the one who called her Miranda a while ago, and because obviously it’s Gerard. “But I’m not sure!” she wails. “I have to find some proof that he’s the one!” The old Angelique wouldn’t care about proof; she’d just start murdering people. The house would be hip-deep in voodoo dolls by now. And of course it’s him, everything is him, he’s tearing through the show like an avenging angel, wielding a flaming sword and dishing out injustice with both hands. Gerard killed Lorna, and framed Quentin, and married Samantha, and manipulated Trask, and seduced Daphne. He is currently the trusted confidant of practically every character on the show, even people who openly hate him. The only person who doesn’t trust him is Angelique, and that will be corrected by the end of the day. Gerard and Gabriel have a scene at the top of today’s episode about who’s going to be Daniel’s new heir now that he’s disinherited Quentin, and if that’s a question in the current storyline, then the answer is perfectly clear. It’s Gerard! Over the next six weeks, Gerard is in 26 out of 30 episodes, including an 11-day streak from 1167 to 1178, and an 8-day streak from 1181 to 1188. 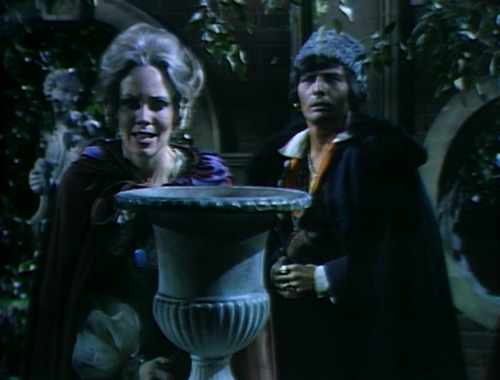 During this period, Quentin and Daphne appear in sixteen episodes, and Barnabas in only eight; Angelique and Julia have to make do with seven apiece. Gerard owns 1840. This beats the previous all-time streak records of Angelique at the beginning of 1795 (25 out of 30 episodes), and Count Petofi in the third act of 1897 (24 out of 30). The only person who matches it is Julia in the run-up to 1795, when she was in 21 episodes in a row, including one that was almost entirely about her playing solitaire. Gerard is at that level. And he achieves it the way that Julia, Angelique and Petofi did, by being smarter and sneakier and funnier than anybody else on the show. He has scenes today with Gabriel, Daphne, Angelique and Laszlo, and in every scene, he knows more than they do, even when it seems like he doesn’t. In act 4, Daphne is suddenly asleep in bed so that Gerard can appear in her dreams and tell her who she does and doesn’t love; then she puts on some clothes and goes downstairs so that Gerard can appear in the drawing room, and do basically the same thing. “One of these days, I certainly will,” she agrees. Then he says, “Good night, Daphne,” and walks out of the drawing room. Gerard does not actually live in this house. 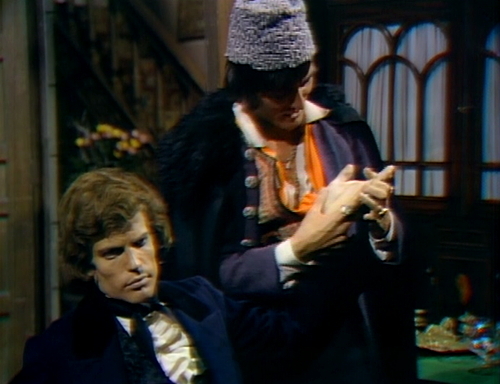 And then there’s the palm-reading scene, which is about as close to a comedy sketch as you’re going to get on Dark Shadows. Angelique’s decided that she needs to cast a spell over something to find out if Gerard is actually Judah Zachery, so she tells Laszlo to drop by the house and steal Gerard’s watch fob. Gerard opens the door when Laszlo knocks, and his immediate response to Laszlo’s greeting is a tired “On your way, gypsy.” Laszlo explains that he has a friend who lives here, and Gerard audibly sighs. “I’m afraid gypsies don’t have friends,” he says. “Now, begone!” When one deals with Judah Zachery, there is no margin for gypsies. But chair-bound Gabriel likes anyone who flatters him, so he invites Laszlo in for another pep-talk palm reading. 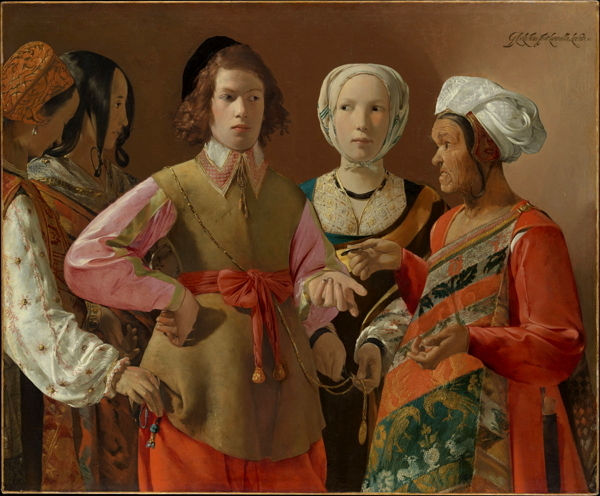 Laszlo provides the expected reading, which is that Gabriel will be extremely pleased by something in the near to medium term, and then Gabriel offers up Gerard’s palm as an extra-credit reading assignment. Gerard on the whole would rather be on the supply side of the spooky secrets; he’s the one who interprets dreams and cures headaches. Besides, this isn’t even his palm anymore. But he gives in with bad grace, looking bored while Laszlo peers at his fin and says that there are some clouded areas which he might be able to see better if he was in reaching distance of Gerard’s vest pocket. So here is our hero, for the next six weeks anyway — a con man, barely pretending that he’s being conned by another con man. He allows Laszlo to pickpocket his watch fob, and when Angelique looks into the fireplace and asks the Prince of Darkness to show her the face of her enemy, he elbows Satan out of the way and sends her a vision of Quentin’s face, just to mess with her. He probably stole the watch fob from Quentin, anyway; he’s certainly stealing the show. Tomorrow: This First Unhappy Experience. In the teaser, Gerard scolds Gabriel, “It was your account of things which led to Randall’s murder, and brought Quentin to jail.” I think what he means is more or less “it was your account of the events leading to Randall’s murder which resulted in Quentin going to jail,” but who even knows with Gerard. Gerard tells Gabriel, “I’m afraid I can’t tell you. You see, I kept my word to Daniel.” He means “gave my word”. When the clock strikes and the camera moves to Angelique, you can see the boom mic. This is Michael Stroka’s last episode, going out with a nice comedy palm-reading routine. He appeared in an Off-Broadway play, Funeral Games, in 1973, and then played a character named Quentin on Edge of Night from 1975-76. He had several guest roles on primetime series, usually with a sci-fi/supernatural bent — Wonder Woman, The Next Step Beyond, Buck Rogers in the 25th Century. His movie appearances include Island of Blood (1982), the Eddie Murphy/Richard Pryor teamup Harlem Nights (1989) and The Closer (1990). He died in 1997. One can almost hear the muted version of the Charley Douglass laugh track during Michael Stroka’s palm reading scene. Douglass was in the laugh track business from the 1950’s well into the 1970s, and had both raucous, medium, and muted versions of those all too familiar laughs – some of those laughs probably more familiar than the actors on screen! Was that Eugene Roche playing the Head? Yes, that was Eugene Roche, playing a cerebral part. Thanks! Eugene has his own Dark Shadows connection, having worked with Thayer David on Kojak. I’ve seen a lot of his performances, but I’d never seen this Roche clip before. Boy, Gerard’s being an even bigger jerk than Gabriel; I almost feel sorry for Gabie Baby. And I must give extra points to Laszlo as “Best Recap Monkey” on DS! Hit all the points, asked all the right questions, even after Angelique’s hellacious slap. Quentin reassures Daphne that there hasn’t been a witchcraft tribunal for a century – but Vicki had one in 1795, only 40 years before (I know they called it a trial, but it sure looked like a tribunal (3 judges & no jury). And even if Vicki “hasn’t gone to the past yet”, there would have been Phyllis Wick). Oooh, takin’ back those extra points, Laszlo; WORST pickpocket EVER. And why oh why oh WHY is Angelique STILL doing her witchin’ in the drawing room? She didn’t even bother to close the doors. No margin for error, Angie… remember? Why doesn’t she just set the clock in the foyer alight and use THAT? Couldn’t be any more public! Yes, everything is comin’ up Judah these days. Barnabas and Julia don’t even seem to be trying anymore. I wonder if Gerudah could be considered JV Kaiju? Barnabas? Julie? Oh, yeah, i remember them. I’m guessing Gerard really likes it at Collinwood, since he hung around for another 150+ years. 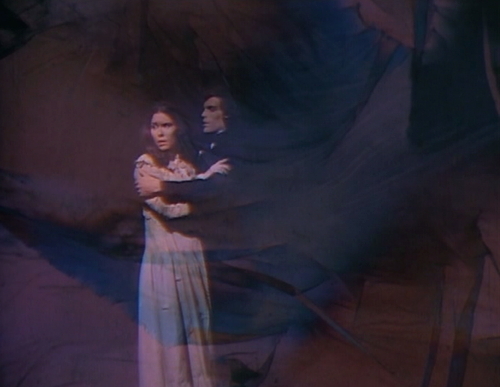 Hate it when Angelique is frightened and being smoothly deceived by anyone. Without her knowing smirk and powerful secrets, she’s only half a kaiju–I say, bring back Power Angie. They really should have cast a better lookin’ Judah Zachery. It’s impossible to believe Angelique could have been lured into that guy’s coven. That head is just not her type. And considering the guys that DS was hiring at the time, you’d have thought Judah would have had (at least) a ‘head’ of hair… even the skeletons had better coiffures! At least with a bald actor, you don’t have to worry about a bad hair day. And a bad hair day showcased in that box would be extra bad. I wouldn’t pick up that thing without a pair of fireplace tongs! I bet he bites. 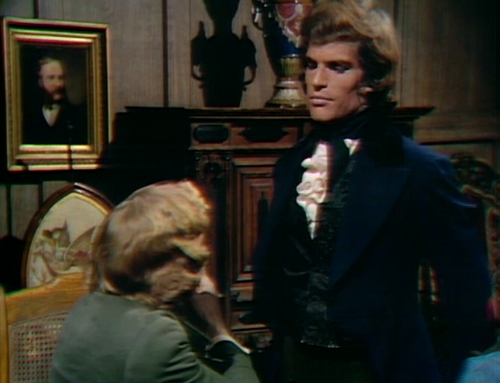 One could easily like to hang around Collinwood – for indeed, when they wanted to, “Dark Shadows” had it’s own unique brand of (on purpose) comedy. Humbly submitted for your approval – any scene with Carl Collins and/or Pansy Faye (whether interpreted by Kay Frye or Nancy Barrett). 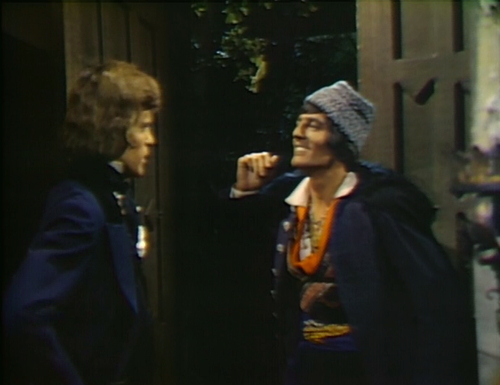 Practically had to pick my jaw up off the floor, watching the comedic interaction play out, as Carl exchanged pleasantries with Barnabas for the very first time in 1897. Same reaction with Pansy Faye, as she premiered “I’m Gonna Dance For You”, to an unsuspecting populace on both sides of the camera. The early Barnabas/Julia interactions can be fun – mostly polite back and forth conversation, when they really can not trust/only somewhat tolerate each other. Don’t know why, but the polite “goodnights” they give each other in the famous candelabra episode, are somehow hilarious in their own way. Roger’s comments after Barnabas gives the costume party. The costume party itself. The writers and actors were pretty much firing on all cylinders here. The 1967 stories were understandably more grim and mysterious (everyone thought at the time that they would soon be kicked off the air, anyway), even so, dry, sardonic humor and quizzical mundane activities were never completely too far away. Barnabas, Vicki, and Burke go house hunting? What was up with that? We will never know. Yes, one could easily like to hang around Collinwood. Strange situations. Colorful characters. Lots of liquid refreshment. Mrs. Johnson’s boiled dinners. What’s not to like? There aren’t any of those comedic moments though, after the show finished with 1897. Leticia should have been more outspoken. While unrelated to this episode, I thought I’d share the historical note that 50 years ago this month Western publishing/Gold Key published the first Dark Shadows comic book. Unlike most publishers, Western did not conform to the Comics Code, which regulated content and expressly forbade the use of vampires. Would Addison Powell’s scenery chewing qualify, as an example, of the (on purpose) low key comedic elements, that would crop up here and there? Powell had already appeared once, during the 1795 storyline, his method acting well on display. Dan Curtis must have known what he was getting into, when casting the part of Dr. Eric Lang, and could not really have been too surprised at the performance results. Then again, Lang was pretty much unhinged anyway, corpse-sewing and life-forcing his way (in his mind) to medical success. So, even if not meant to be out and out humorous, the annoying interpretation of the Lang character still kind of made sense anyway. Certainly would always bring a smile to at least one viewer. Those heady days of 1967, 1968, and 1969. Long gone by the end of 1970. Everybody just wants to leave that Manhattan studio and go home now. When watching Dr. Lang from my perspective in 2018, he seems a representation of the scientist hero mixed with an equal portion of mad scientist. He’s a characterization that one typically saw in B movies in the 1950s and 60s. Within that context, I think the actor’s portrayal is perfect. I’m including the Japanese monster movies in this assessment, but basically you have a stereotypical, older but distinguished, still vital male that apparently thinks he can handle anything within his exceptionally wide sphere of expertise. He is simultaneously the reassuring voice of reason and the patronising know-it-all, who finds out he still has a lot left to learn. He’s a man of science who doesn’t recognized he’s not only crossed the lines of ethics and reason but has wandered deep into supernatural territory. Even when Lang is finally forced to recognize sorcery / witchcraft he defaults into the absentminded-professor role and can’t hold onto his protective amulet. I suspect Julia was in college during World War II. It’s possible she got into medical school because the number of men who were away fighting affected the applicant pool and might have made a few of the school administrators consider what would happen if a significant portion of men were not alive to practice medicine in the future. If that were the case, Julia was probably still training when the men came back from the war. I can only imagine how difficult it was for her at that time because at least some people around her would see her as occupying a slot that should have being filled by a returning war hero. Of course as Danny has pointed out, Julia is more of an alchemist than a scientist. That gives her the mad scientist title just like Lang. Maybe it’s not a coincidence that male MD’s don’t fare very well when they get to close to her or her subjects. I finally caught up! Three cheers! Got to agree with you on the B movies comments. A group of friends and I get together once a month to watch these, and I’ve often thought how some of their plots would have been ripe for the Dark Shadows treatment. Re. Julia – at this point in the series I think the writers are all over the pkace with her characterisation. At one point she’s a mad scientist kaiju, the next she’s a damsel in distress (which is a definite waste of a good Julia.) At best ahe is the mendacious lie machine and confronter of monsters we’ve all come to know and love. When it’s all said and done, maybe we should all just jump over to another group that we create. Head over to “Dark Shadows From The Beginning”, by Prisoner of the Night – informative and fun, with some very interesting sidelights. Now I understand why I always liked Addison Powell’s performance. A good example of Dr. Lang’s mad scientist persona is when he tears open the drapes in Barnabas’ hospital room at 4 o’clock – in the afternoon! Addison gave Dr. Lang a dramatic flourish worthy of any good 1950’s horror doctor. I liked that bit of scripting (“It’s four o’clock in the afternoon!”) because the show aired at 3:30 – 4 p.m. (Eastern/Pacific) at that time. It was literally only a couple of minutes to 4 when Lang said his line. It is with a heavy heart that I have given up hope of the objective of this blog ever being completed. It was great fun! Fear not, Danny – we can wait as you abide in the realm of Marilyn Ross, and hope for your safe return. ps are you missing any volumes from the set? Please, review Barnabas Quentin and the body snatchers. Marilyn Ross’ collaboration with a posthumous Ed Wood.